I can actually tell you the approximate last time I bought something from the vending machine here at work. It was in February 2014. If that seems odd that I know that, read on. It’s kind of a funny story. I’m normally not a big buyer at any vending machine. I’m a frugal guy and I know that vending machine products cost way too much money. 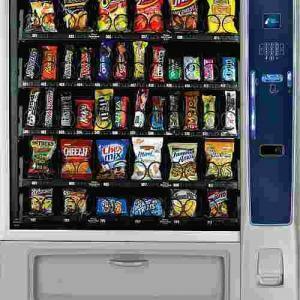 Generally, I’d use the vending machine to buy a snack, and so to make sure that buying from the machine didn’t turn into a regular habit, I usually keep a small stash of snacks in my desk drawer. Cereal bars, granola bars, crackers, or other such things that satisfy most mid-afternoon cravings as they pop up. Still, the song of the vending machine was often something I couldn’t pass up when it came to the occasional candy bar. So, when temptation hit and I just couldn’t resist, I went off to the vending machine and satisfied my craving. Honestly, it was probably once every 4-6 weeks. Often enough that it was sort of ‘regular’ but nowhere near often enough that I felt guilty about it. The price was, after all, 80 cents. I figured the 6-8 bucks a year wasn’t really a bad proposition. See, while I knew I could get them cheaper elsewhere, the fact was if I got them elsewhere I’d probably get more, so in the end, the lower price would mean, well, that I’d get fatter. So, 80 cents it was. I told you that the last time I bought the vending machine was roughly in February. I know that because of the date above. See, March 4, 2014 was a Tuesday. It was also the day before Lent was starting that year. I grew up Catholic, and it’s a common practice as a Catholic to give up something for the period of Lent. It’s meant to acknowledge the sacrifice that Jesus Christ made by dying for us on the cross. He gave his life, we give up something that we love for a few weeks. We definitely get the better end of the bargain on that one, that’s for sure. In any case, Lent was starting the next day and I’d already made the decision to give up chocolate. So, like probably everybody else that gives up something does, I decided that if I was giving it up starting tomorrow, that I was darn well going to enjoy it on the last day before the ‘giving up’ started. I grabbed my dollar bill and headed over to the machine. I stuck the bill in, punched in the spot number and waited for my delicious Milky Way bar to fall down. I looked over at the display and it was flashing that it needed more money. The price had gone up! Now, you might think that boycotting a vending machine for over two years is a bit irrational because of a price increase. But that isn’t the full story. See, I get that prices go up. I am fine with it. If memory serves, I’d been buying candy bars at 80 cents from that machine for several years. So, the price going up was not the problem at all. It was what they raised the price to. That’s right, a dollar and five cents. FIVE CENTS. It actually still makes my blood boil. Now, see, while I’m sure some people already get it, maybe there are others still confused. So I’ll explain. Many people put bills in vending machines. I generally don’t carry around many coins at all. So, if I wanted to get a candy bar and didn’t have change, that meant that I would have to put in two dollars. And then I’d have to carry around ninety five cents worth of change. It was just absurd and I refused to do it. I actually took the money back out and denied myself my last Milky Way bar before Lent. And I haven’t been back since. Afterward, I took a look and having known some of the prices of some of the other items, I saw that what they had done was simply raise the price of every single item by 25 cents. That was just pure laziness in my mind, and I wasn’t having any of it. The bottom line was that I was incensed that they couldn’t raise the price of the candy bar by an amount that made sense. Twenty cents and it would have amounted to an even one dollar. But, no. They couldn’t do that. And I haven’t been back. Probably a bit irrational, but it made sense to me. These are the types of things that I take offense to, even though it was largely probably someone being lazy. Now, I’ve sort of lost my anger over all that, but I sort of just keep the streak going because it’s been over two years and I figure why break the streak. Readers, have you ever gotten angry over something that probably wasn’t a slight but you couldn’t get over anyway? Also, what are your favorite candy bars? Please let me know in the comments below. And it’s exactly the kind of reaction I’d have, myself. Since I have the personality of a rufous hummingbird — in a rage at all times — I couldn’t even begin to count the times I’ve written off some retailer in a snit. I do not shop at Bed, Bath, & Beyond, for example, because once a manager was rude to an employee when she tried to help me with a question he felt was somehow beneath answering. I do not shop at Summerwinds Nurseries because they pay their employees on commission, which once led to a shouting match in a manager’s office that was audible on the sales floor. Abuse your employees and you don’t get my business…abuse me, and you ARE likely to get something: a complaint from an attorney general’s office or an enraged letter to your home office explaining why I’ll never buy anything from you again. Milky Way. Absolutely the best. But much, much better back in the day when they used real chocolate and better ingredients. Definitely all good reasons to stop patronizing those businesses. I am a fan of the Milk Way…DARK…..But no way I would spend $1.05 for a candy bar. Those same candy bars were a nickel when I was a child and were 25 cents when I owned a store 35 years ago. Few things you can say that went up over 4 fold in 35 years…. Sadly, as far as vending machine prices go, I’ve seen much worse. Milky and Twix for me! See how easy that was! These operators need to take note! I am not really a vending machine fan, but my favorite vendo snacks are Peanut M&M’s and Baked! Lays Original!